Meyer lemons are just coming into season in southern California. I have two Meyer lemon trees in my backyard, but they are completely out of sync with the rest of the Meyer lemon world. Everyone else's lemons start to ripen around Christmas. Mine start to ripen after Easter. Fortunately, I've discovered that I can let the Meyer lemons hang on the tree for months without ill effect. In fact, they get bigger and juicier. Some of my Meyer lemons are more like big oranges. I've still got some ripe ones hanging from last season. Which means that, effectively, I have Meyer lemons all year long. And that's nothing to complain about. 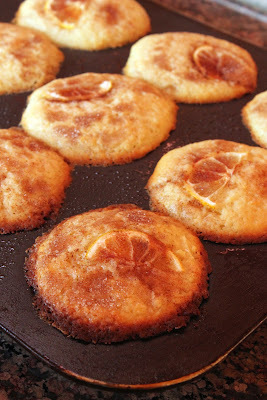 These Meyer lemon muffins are tart and wildly aromatic because the recipe, which was created by the Los Angeles Times, uses the whole lemon - peel, flesh and all. One note: The slice of lemon on top looks pretty but I was the only one willing to eat it. My kids picked it off. The muffins taste just as good without the decoration, so go your own way. A bunch of other bloggers have reprinted this recipe on their blogs, but I'm not going to do that. It's not right. The LA Times paid someone to develop the recipe and the paper owns that content. I hate it when people reprint my recipes without asking - do unto others, etc. 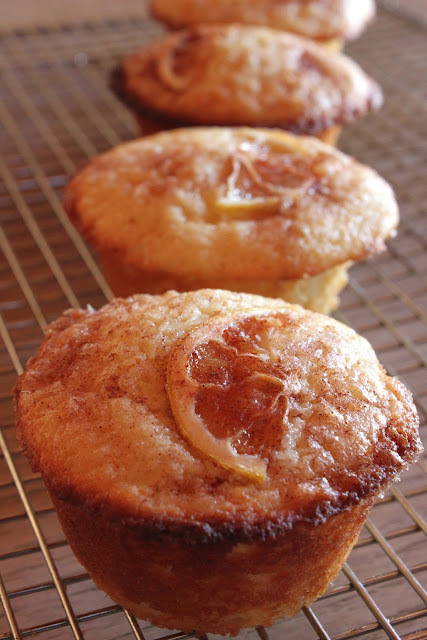 So click here to get the LA Times's Meyer lemon muffin recipe.